Over the next decade, big-cabin business jets – from super-midsize to business airliner classes – are expected to secure the highest demand, capturing 57% of all global deliveries, according to a just-released forecast by Honeywell Aerospace. Honeywell’s 2018-2027 forecast projects 10-year global demand for 8,300 business jet deliveries worth $249 billion. Including commercial airliners modified into business aircraft, the forecast projects demand for 8,600 aircraft worth $264 billion. The forecast predicts 2017 deliveries of 620-640 new jets, a decline of about 30 jets from 2016 figures, as orders slow for mature aircraft models and many buyers wait for new models to enter service, said Gaetan Handfield, Honeywell senior manager of market research. 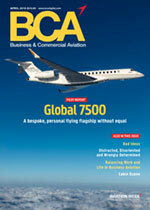 Many are also waiting for used aircraft pricing to firm up before they trade up to a new business jet. In 2018, deliveries are expected to improve by 15-20 business jets over 2017 results, followed by 3-4% annual increases in the years that follow, the forecast said. “Declining used aircraft prices, continued low commodities prices, and economic and political uncertainties in many business jet markets remain as near-term concerns for new jet purchases, leading to a modest growth in 2018,” Diggs said. While big-cabin jets are predicted to take up more than half of the deliveries in the next decade, they are expected to represent 85% of the total value. Eighteen percent of the units delivered and 8% of the dollars are expected to come from midsize jets, while 25% of the units and 7% of the dollars are expected to come from small cabin jets. In a survey of 1,500 operators, respondents said they expect to make new jet purchases equivalent to about 19% of their fleets over the next five years, either as replacements or additions to the current fleet. By region, about 61% of all global demand is expected to come from North American operators over the next five years, with about 39% of operators surveyed saying they plan to schedule their purchases in 2018 and 2019. New aircraft purchase plans are lower in this year’s survey than in the 2016 survey. About 15% of the global demand is expected from Latin America over the next five years, with about 34% of the region’s projected purchases planned for between 2017 and 2019. About 14% of global demand is expected from Europe over the next five years, with 33% of the purchases expected to take place in 2018 and 2019. Nearly 45% of the purchase are scheduled for 2022 and beyond. New jet purchase plans declined significantly this year compared with the 2016 survey, as operators contend with sluggish growth, the uncertain effects of Brexit, a refugee and migrant surge, and continued threats of terrorism, the forecast said. The Middle East and Africa are expected to take 4% of global demand over the next five years, in line with the historical range of 4-7%. About 18% of respondents there say they will replace or add to their fleet, down from 21% a year ago. About 36% of the operators said they plan to schedule new purchases within the first two years of the five-year horizon. Asia-Pacific is expected to represent about 6% of the world’s demand for new jets over the next five years. Operators report they are planning new jet acquisitions for 13% of their fleet over the next five years, significantly lower than last year, with 27% of the respondents planning to schedule their new purchases within the first two years of the forecast. In the used market, asking prices are still declining overall, especially for medium- and long-range sectors, despite a 7% improvement in inventory levels compared with a year ago. The total number of jets fewer than 10 years old listed for resale is down 15% from a year ago and is less than 8% of the installed base. However, recent model jets for sale remain more than 30% of the total listings in comparison with 15-20% pre-recession levels.